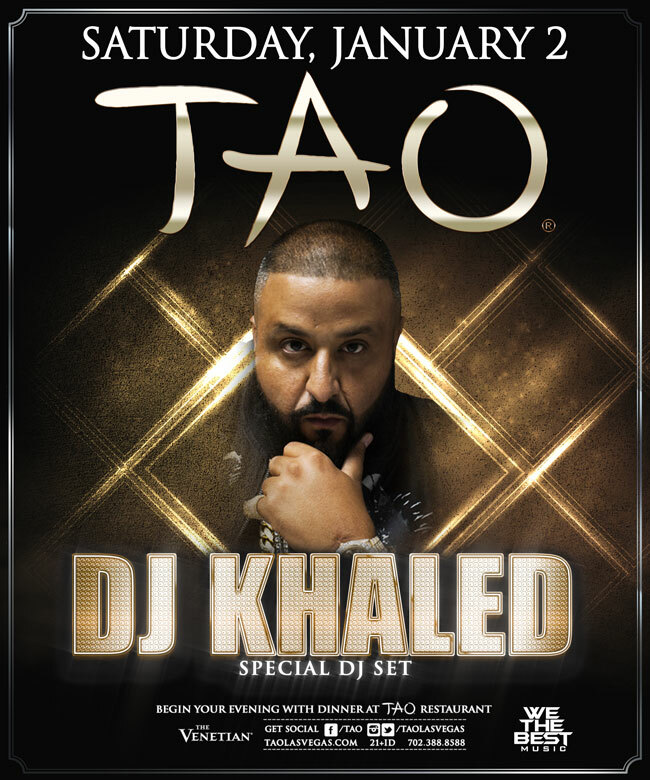 Contact City VIP Concierge 702.741.2489 for Table & Bottle Service and everything VIP New Years at TAO Las Vegas. Khaled Mohamed Khaled (born November 26, 1975), better known by his stage name DJ Khaled, is an American record producer, radio personality, DJ and record label executive. He is a radio host for the Miami-based urban music radio stationWEDR and the DJ for the hip hop group Terror Squad. In 2006, Khaled released his debut album Listennn… the Album. He went on to release We the Best (2007), We Global (2008), Victory (2010), We the Best Forever (2011), Kiss the Ring (2012) andSuffering from Success (2013). In 2009, Khaled became the president of record label Def Jam South and he is also the CEO and founder of We the Best Music Group. Currently, he hosts the weeknight program TakeOver on Miami-based urban musicradio station WEDR with fellow host K. Foxx; Khaled states that he has worked for the station professionally since 2003. In 1998, Khaled worked as a DJ for M Luther Campbell for Campbell’s Friday night WEDR radio show The Luke Show.